Do you ever look at something you’ve seen a jillion times and suddenly have a renewed appreciation for its beauty? That happens to me all the time. 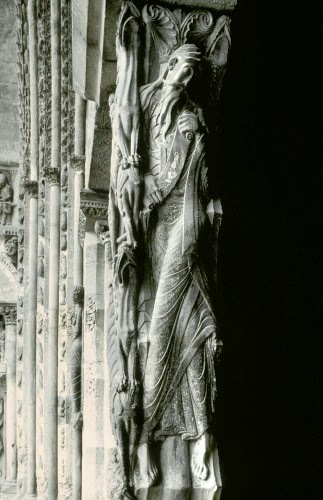 While cataloging, I came across images from our collection of the jamb sculptures of Chartres Cathedral; probably among the most renowned in Western art history, and some of them the oldest existing examples of Early Gothic sculpture. Chartres was built during the great church building boom of the late Middle Ages (ca. 1200–1400). It was under construction continuously from about 1134 to 1510, with the main body of the church being consecrated in 1260. The Gothic part of the church was built after a fire in 1194 destroyed the main church, but left these gorgeous sculptures intact on the west façade. During the Romanesque period (ca. 1000–1200), sculpture of the human form, which was almost entirely religious (Christian) in subject matter, was abstracted because of the emphasis on the spiritual in art rather than physical reality. 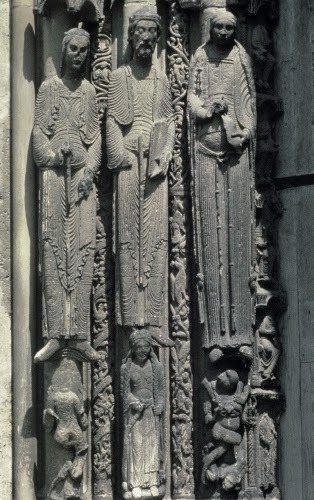 Romanesque sculpture was characterized by flattened, stylized, elongated forms, such as the image below of a trumeau (center post) sculpture from the Abbey Church in Moissac. Note how the feet seem to float against the colonette on which the figure is attached. 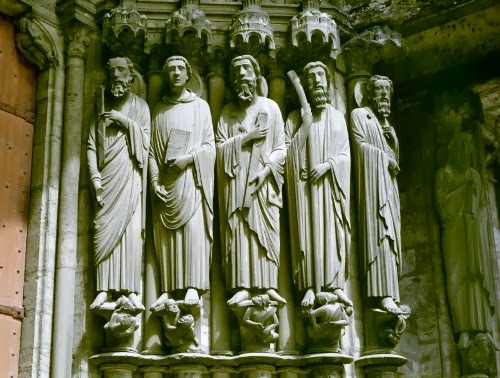 The west portal figures from Chartres are much more convincingly depicted standing and are more detached from their colonettes. This change took place in the space of ten to fifteen years! While they still have the elongation of Romanesque sculpture, the drapery is more deeply carved and faces less stylized. Let’s go forward another 50 or so years at Chartres and see the figures from the south transept portal. They are even more deeply carved, and less a part of the colonettes in front of which they stand. The drapery almost seems to emulate ancient Roman sculpture. These figures are compellingly monumental and plastic compared to those from just 50 or 60 years earlier, with definite attention given by the artists to the physical mass of the human body (even though it’s covered in robes). I love doing comparisons like this! It shows that art is a living, growing thing! Studio activity: An early Gothic figure. On a thick piece of cardboard or thin piece of wood, form a long, narrow column of clay as if it were attached to a colonette at the doors of a Gothic cathedral. Keeping the back of the column flat against the board, round the front of it. Create a figure, male or female, emphasizing line using either clay carving tools, or a pencil. Choose whether a shallow relief is desired, or a more in-the-round figure. Remember to stylize elements such as drapery, facial features, gestures, and objects the figure might be holding. Update the clothing to the 21st century.